Habit No. 1: Be proactive. Habit No. 2 Begin with the end in mind. “This habit is based on the principle that all things are created twice. There’s a mental or first creation, and a physical or second creation to all things.” In other words, visualize what you want as if it already happened and the universe will begin to work wonders. Habit No. 3: Put first things first. Habit No. 4: Think win/win. Habit No. 5: Seek first to understand, then to be understood. Habit No. 7: Sharpen the saw. 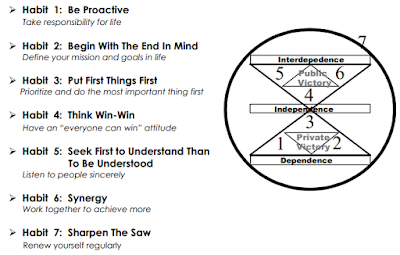 “It’s renewing the four dimensions of your nature—physical, spiritual, mental, and social/emotional.” Covey writes about continuous self-improvement. Commit, learn, and do. 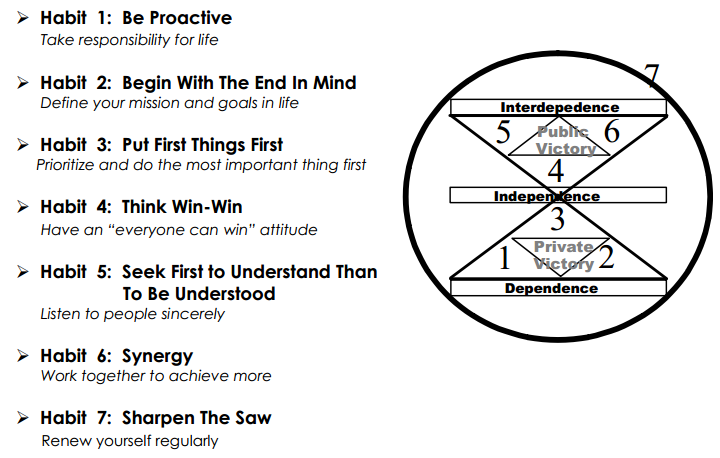 Below are 10 quotes from Stephen Covey that have the power to completely change the direction of one’s life. 1) The key is not to prioritize what’s on your schedule, but to schedule your priorities. 2) The main thing is to keep the main thing the main thing. 3) Live out of your imagination, not your history. 4) Trust is the glue of life. It’s the most essential ingredient in effective communication. It’s the foundational principle that holds all relationships. 5) Most of us spend too much time on what is urgent and not enough time on what is important. 6) I am not a product of my circumstances. I am a product of my decisions. 8) I teach people how to treat me by what I will allow. 9) Love is a verb. Love – the feeling – is the fruit of love the verb or our loving actions. So love her. 10) Live, love, laugh, leave a legacy.